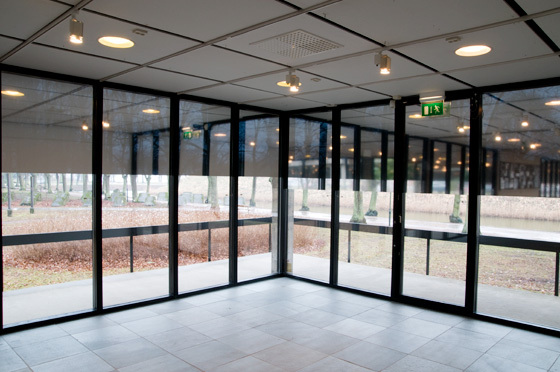 Synrand, mirror foil on windows, Landskrona Konsthall, 2009. Patrik Aarnivaara and Jakob Simonson are fascinated by the modernist aesthetic and the bold character that defines Landskrona Konsthall, where they explore the collision between the architecture of the building and its function as an exhibition space. Instead of using the building as an exhibition space for art or other activities, they want to empty it and put focus on the architecture. The Konsthall itself thus becomes the point of departure for their project: the Konsthall as a hybrid of building, sculpture and image. The artists begin with the physical construction of the space, the grid of squares and rectangles found everywhere and the iterative aesthetic in which the concrete structure, windows, walls and floor tiles repeat without changing. 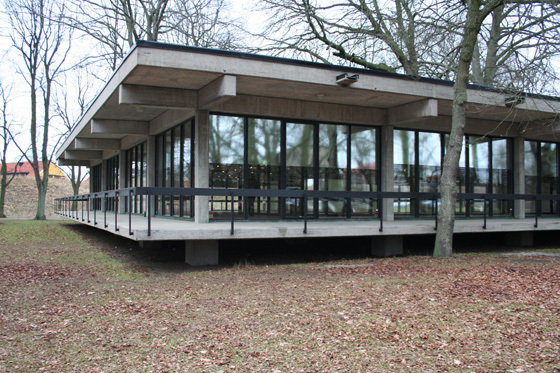 The windows are the distinct boundary between interior and exterior, but their transparency enlarges the contact between inside and outside until the Konsthall itself becomes elusive. 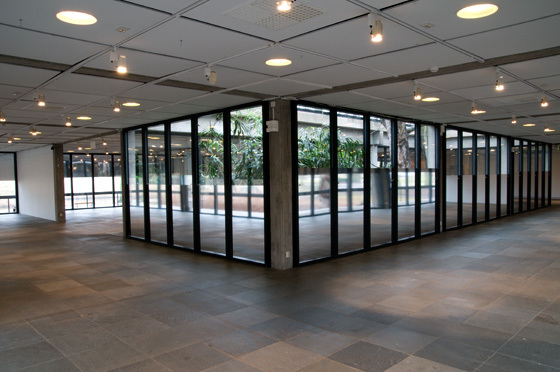 To make the interior and exterior of the building visible and interrupt the viewer’s gaze, they cover the windows with mirror film. The glass façade facing the park is covered halfway with film, from the top down to eye-level, and the façade facing the atrium courtyard from the bottom up to eye-level. The surfaces thus become at once transparent and reflective. The iterative pattern is repeated, but through the mirror film’s splitting of the window into two parts, antithesis is created in the window itself. Two images of discrete content are forcibly conjoined in the intersection between the parts. Focus is on the building, but equally upon the viewer, who is an essential component of the work. Viewers see not only themselves, but others who, like the building, are reflected in the window, even as the gaze can simultaneously look outwards. The nature of the building as an object is emphasized and various parts of the interior and exterior are reflected depending on the viewer’s height, position and movement inside or outside the space. The surface is changed by the images created on the windows. The gaze ricochets and continues, stops and passes, sees and sees through the building.